The Latvian collections span the period from the founding of an independent Latvian state in 1918 to the contemporary era. 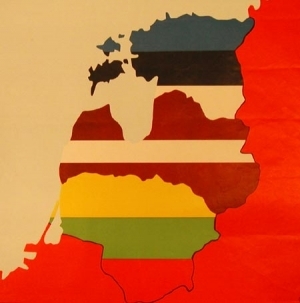 They pertain to Latvian diplomacy in the interwar years, the annexation of Latvia by the Soviet Union, and political repression under Soviet rule. Some materials concern Latvian refugees after World War II and the movement leading to renewal of Latvian independence in 1991. "The Rescuer and the Rescued: A Latvian Story of the Holocaust"
Jacobs, David. Baltic States Collections in the Hoover Institution Archives, ca. 2003. Jacobs, David. Baltic States Collections in the Hoover Institution Archives (Latvian), ca. 2003. Andris Razāns, Latvia’s ambassador to the United States, visited Stanford University on December 2, 2013. As part of his visit, Ambassador Razāns came to the Herbert Hoover Memorial Exhibit Pavilion, where he was shown materials from the Latvian collections of the Hoover Institution Archives. Latvia's Foreign Minister Artis Pabriks visited the Hoover Institution on September 21, 2005, where he viewed library and archival materials relating to Latvian history. Twenty-one audiocassette recordings of interviews with Latvian officials, opinion makers, and cultural figures have been digitized for preservation and access by Hoover’s audio lab. The Latvian Oral History Project interviews were conducted in 1999–2000 by David Jacobs of the Hoover Archives to document political and social conditions, as well as cultural trends, in Latvia at the time. Each interviewee was asked a set of questions designed to elicit information on leading issues of the day in a country that had become independent again in 1991, following the breakup of the Soviet Union. 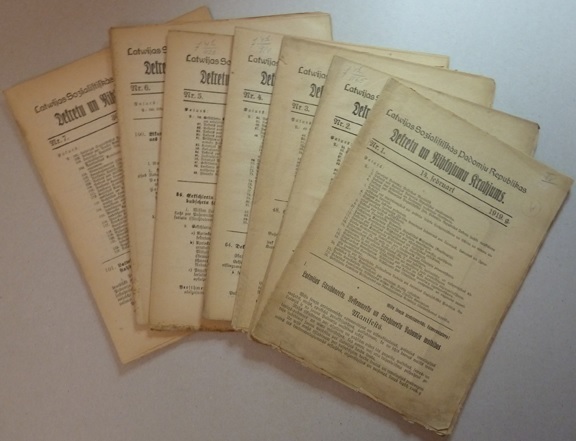 A unique Latvian collection has been added to the holdings of the Hoover Institution Archives consisting of more than a hundred items: underground leftist publications, pamphlets, leaflets, calendars, manuals, and ephemeral periodicals. The collections in the Hoover Institution Archives provide a record of history both large and small. It is often the exceptional stories of individuals that make larger events come to life. Edward Anders, a retired astrophysicist living in Burlingame, California, is sponsoring research into a story that is informed by his own life and the circumstances under which he survived the Holocaust in his native Latvia. Much of Alexei Milrud’s collection relates to the activities of his father, Mikhail Milrud, editor of the newspaper Segodnia in Riga, Latvia, between the two world wars. The collection includes materials on Mikhail’s career and copies of his NKVD file (he was arrested by the Soviets when they incorporated Latvia), as well as materials relating to the newspaper and the history of Russian publishing in Latvia. Latvian images from underground leftist publications, pamphlets, leaflets, calendars, manuals, and ephemeral periodicals.